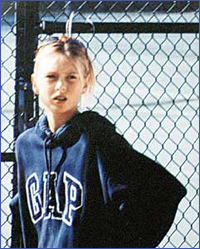 Maria Yuryevna Sharapova was born poor. In 1986, her parents fled their Russian hometown when the Chernobyl nuclear disaster struck. When she and her father, Yuri, flew to America in March of 1996, they brought with them only $700—borrowed from Maria’s grandparents. Worse, both Sharapovas spoke no English. Maria, aged 17, goes on a fairy-tale London ride and wins the 2004 Wimbledon. Two years later, she captures the 2006 U.S. Open and soon after becomes the no.1 women’s player on earth. Today, everybody knows Maria. We know her blonde, flowing hair. We see her green eyes glisten like the Wimbledon grass. We marvel at her long legs and 6-foot-2 frame. We watch her wear make-up, dangling earrings, miniskirts. And, especially to the male species, this we know: she’s HOT. According to Maxim magazine, for the past four years she’s been “the hottest athlete in the world.” And, not to be outdone, FHM magazine has proclaimed her as No.8 in the “100 Sexiest Women in 2006” list. What more? Maria is rich. So wealthy, in fact, that she has been named “the highest-paid female athlete in the world.” Her earnings? $20 million. Per year. In endorsements. Not including the millions more she wins in prize money, you can do the math and conclude that she’s extremely wealthy. And if you think earning P800 million (yes, that’s $20 million) per year in sponsor’s money is huge, consider this: according to Forbes magazine, Sharapova earns a phenomenal $1.35 million a day. A day? How can that be? The reason is because Maria limits her sponsors’ access to her time to 10 days to 12 days a year—freeing her from doing any non-tennis-related work most of the year, in particular within four weeks of any tournament. Unbelievable. But true. For here’s what I’ve discovered: In sports, just like in the movies, it’s all about the looks. Sure, Maria is good. And among all the women, she’s one of a handful who fight for every shot. Plus, she’s world no.5 today at the Australian Open. But compare her with, say, Justine Henin, who owns 40 titles (including seven Grand Slam singles titles), the Athens Olympic gold medal four years ago, possesses “the best single-handed backhand in the men’s or women’s game” (according to John McEnroe), and is the world’s no.1 player. And so, head-to-head, on-court Sharapova is no match for Henin. But head-to-head in endorsements (and, well, in height: Henin stands 5’5” while Sharapova is 6’2”), they’re no match. Why is that so? Sports is entertainment. Sports is like the movies. Sports is Hollywood. We are entertained by what we see on TV. Looks. Beauty. Long legs. Blonde hair. Green eyes. All these rolled in one package named Maria Sharapova—a tennis player who happens to be a supermodel. Great points, John. We have an image-based culture perpetuated by media.